Guide Price £230,000 to £250,000. 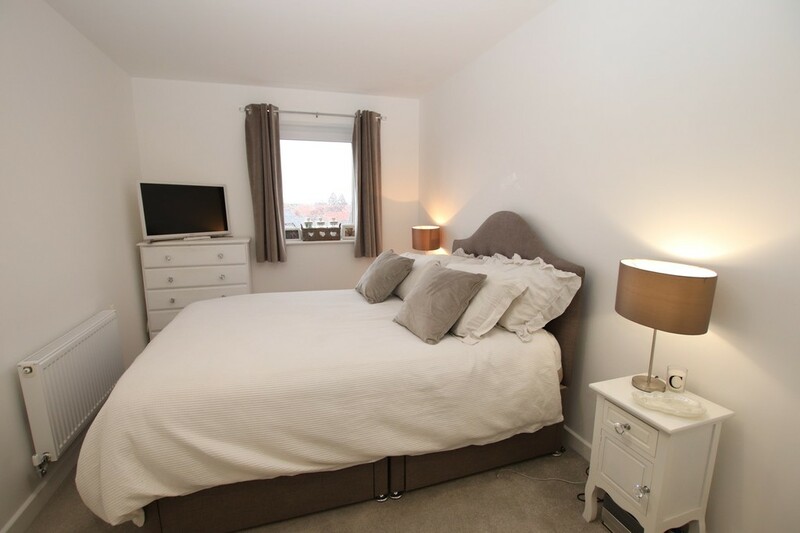 Completed in December 2017 by Taylor Wimpey, we are delighted to offer this immaculate two bedroom, two bathroom third floor balcony apartment which has the 'WOW' factor! Viewing Highly Recommended. The accommodation comprises, communal security entrance with a choice of lift or stairway, spacious inner entrance hallway, open plan living/dining/kitchen reception with access to the balcony, bathroom, master bedroom with en-suite shower room and second bedroom. There are many appealing features which make this property an ideal first time purchase and we can HIGHLY recommend an internal inspection to appreciate the quality of property on offer. COMMUNAL ENTRANCE Security entrance door with lift and stairway INTERNAL HALLWAY 18' 3" x 4' 6" (5.56m x 1.37m) Entrance door, storage cupboard, radiator, carpet OPEN PLAN LIVING/DINING/KITCHEN AREA 16' 10" x 15' 9" (5.13m x 4.8m) Double glazed doors to balcony and window to side, carpet to living area, laminate floor to kitchen area, matching range of wall and base units, single drainer bowl and a half sink unit with mixer tap, built in electric oven and gas hob, integrated dishwasher and washing machine, cupboard housing boiler, double window to front. BEDROOM 1 20' 7" x 8' 4" narrowing to 6' 7" Double glazed window to side, radiator, carpet. EN-SUITE SHOWER ROOM comprising shower cubicle, wash hand basin on pedestal, low level WC, radiator. BEDROOM 2 12' 6" x 9' 9" (3.81m x 2.97m) Double glazed window to front, radiator, carpet. BATHROOM 7' 6" x 5' 7" (2.29m x 1.7m) Matching suite comprising enclosed panelled bath with mixer tap, wall shower with screen, low level WC, wash hand basin on pedestal, part tiled walls, radiator, extractor fan. PARKING Allocated car space GARDENS Communal. TENURE: Leasehold 125 years from 2017, Service Charge approx. £1,200 pa, Ground Rent £125 per annum AGENTS NOTE: Under the Estate Agents Act 1979 we are declaring a Personal Interest in the sale of this property. DISCLAIMER: These particulars form no part of any contract and are issued as a general guide only. Main services and appliances have not been tested by the agents and no warranty is given by them as to working order or condition. All measurements are approximate and have been taken at the widest points unless otherwise stated. The accuracy of any floor plans published cannot be confirmed. Reference to tenure, building works, conversions, extensions, planning permission, building consents/regulations, service charges, ground rent, leases, fixtures, fittings and any statement contained in these particulars should be not be relied upon and must be verified by a legal representative or solicitor before any contract is entered into.